Image from Carolrhoda Lab Books via readdisruptrepeat. DISCLAIMER: I hesitated to write about this book because Ashley Hope Pérez has already written the perfect review, excerpted on the back cover: “I WANTED TO BURN DOWN THE WHOLE DAMN WORLD AND BUILD A NEW ONE WORTHY OF MACY. . . . UNFORGETTABLE.” But maybe you haven’t seen the book, let alone picked it up. In that case, allow me to introduce you to Nonieqa Ramos’s novel: The Disturbed Girl’s Dictionary. Be sure to fasten your seatbelt, because the Dictionary is a helluva ride. Whoa, right? This book goes straight to the jugular. This is not a tidy, predictable story about a troubled teenager, `a la ABC Afterschool Special. This is a raw and unsettling journey. As you’ve probably gathered, the Dictionary is a page turner, but not a beach read. This book tackles many serious issues and themes: loyalty, neglect, hunger, education, sexual assault, foster care, friendship, prostitution, poverty, ADHD, kindness, and drug use. Somehow, in the midst of such hefty subject matter, there is also a great deal of humor. Kudos, Ms. Ramos. It is a dictionary. Given the title, that should have been obvious, but when I read the words, “See H for Helmet,” it took me a while to realize that I could actually thumb through the book to find an entry entitled “Helmet.” (Among the H’s, no less.) But the words are defined on Macy’s terms. Macy has clearly had enough of the definitions forced upon her, like “disturbed.” This is our chance to see her actions from her perspective. Why does she steal from the grocery store, but refuse to eat what’s in the fridge? Why does she torment her history teacher and deface school property? Why does she give her mother’s coat to a prostitute? Or punch a boy in the jaw? The Dictionary is a diary as well. Macy (last name MYOFB) writes in it whenever she has time—e.g., outside the Principal’s office, waiting to be reprimanded, or in Homework Club with the supremely wonderful Miss Black. Macy’s opening entry is “ALWAYS/NEVER,” a linguistic combination that her history teacher considers grammatically flawed. Macy proves otherwise in the most poignant of ways. Have tissues handy. The chaos of the protagonist’s external and internal life is reflected in the structure of the book, which is arranged neither chronologically nor, technically, alphabetically. Mostly the entries are lumped like DVDs at the library: A-W-A-Y before AFRAID, MONSTERS before MAYBE, but then BURY comes after FIRELIGHT. Go figure. What is revealed—and when—depends on what Macy is moved to share at any given moment, so I recommend reading a hard copy to facilitate flipping back and forth between cross-references and entries. Nothing is cut and dried. The book raises a lot of questions and doesn’t pretend to have all of the answers. Is her brother better off in foster care? Why does Macy’s friend George wear a helmet? Even Macy doesn’t seem to know. That’s OK with me; I don’t need everything explained in essay form. As Macy explains, LIFE IS NEVER LIKE THAT anyway. You are the person that I’m going to hunt down and assassinate when I find out you took my dictionary. I will hit your head so hard against the sink you won’t remember anything I wrote. . .Yes, the sink. That way I can wash your blood off my hands so I don’t ruin my sweatshirt. Luckily she didn’t catch me reading it. You may be wondering, is this a perfect book? Close, but the answer is no. There were passages that I had to read and reread, a few bits and pieces that didn’t ring true. Since the narrator is openly struggling and unreliable, let’s assume that was intentional. In any event, it doesn’t matter. Macy burst into three dimensions and haunted me long after I finished the book. I can still see her sleeping in the tub, swallowing paper, sneaking books from the recycling, saving two m&ms. She is all too real. I HEART Macy. My recommendation? Buckle up and get to know her. It’s hard to know where to start besides the obvious: READ THIS BOOK. Quick Plot Summary: The Hate U Give is about a sixteen-year-old African American girl caught between the two worlds she inhabits: Garden City, the economically disadvantaged neighborhood where she lives, and Williamson Prep, the elite private school she attends in the suburbs. In her struggle to belong in both worlds, we see Starr constantly jockeying to make the transition between home and school appear seamless. Indigenous Peoples’ Day approacheth–and that’s not the only reason I’ve been thinking about the native peoples of the United States recently. The Dakota pipeline controversy erupting through the midwest is a reminder that a long and bitter legacy of disrespect continues. I chose this particular activity because it was from the Hohokam people–of whom I’ve never heard, not even once. Since the Hohokam lived in what is now central and southern Arizona from around 200 to 1400, let’s hope I would have studied them had I grown up in the Southwest. Note: I include a pathetically brief overview at the end of this activity. Hohokam people gathered shells from the nearby Gulf of California, and were highly skilled shell artisans. In particular, they are known for etching shells, and are probably the first people to ever etch objects of any sort, despite Wikipedia’s apparent ignorance on the matter. Traditionally, they would cover a shell with a protective substance—sap or pitch from the trees—and use a tool to scratch off the design they wished to create: animals such as lizards and frogs, or geometric patterns, for example. These shells were then soaked in an acidic liquid (probably fermented cactus juice) to eat away the exposed areas. Finally, the pitch was scraped off. The shells might be painted as a finishing touch. You can read more here. Just read Leslie Blanchard’s essay about her approach to the problem of bullying: making sure that her child sees outsiders as a human beings. I have pasted it here, but you can click here for the original link. A note from Beret: In the comments section of the Ms. Blanchard’s article, I noticed that some folks interpreted the author’s intervention as “forcing a friendship.” By my reading, she was merely teaching her daughter the power of social capital, and insisting that she take the time to meet someone before deciding she didn’t like them. That seems reasonable and potentially life-changing for both sides of the bullying equation. Image from Everything Under the Sun. Puberty is a wild ride; I must have forgotten. Or maybe–despite the hideously awkward classroom discussions and cheesy pamphlets–I just experienced puberty as my own ridiculously crazy life, rather than as a period of adjustment and development that everyone experiences. As the parent of two tweens, I get to relive plenty of adolescent drama and excitement, and this time around, I’m hyper-conscious about what I do and say that might impact the way my girls are thinking about their own health, beauty, and developing bodies. I want them to know that they are growing and changing in just the right way; that human beings are beautiful, and that each and every one deserves respect and kindness no matter what they look like. Growing up, I got dessert now and then, but candy was a rare commodity. All we had was a value pack of Trident in the kitchen cupboard, tucked between the mixing bowls and the vitamins. I had to hoard my Halloween stash and divvy it out slowly, making it last until Easter, which was the only other time of year that candy was prevalent. Now I’ve got two kids of my own. For a while, both seemed equipped with the same level of restraint–despite the fact that I don’t mind having a little candy around the house–but once the oldest hit puberty, she went nuts. She’s become a maniacal candy hound, the likes of which I haven’t seen since The Great Cornholio. I don’t even know where she gets most of it. Now I find wrappers stuffed in the car door, on the bookshelf, in her pockets, bags, and between the cushions of the couch. “Why do you put the gummy bears in the cupboard where I can find them?” she asked one day, when I walked in and found her holding an empty bag. It was time to find a way to satisfy her cravings for sweets without her sneaking around, binging on corn syrup and food dye. Reading level: 4-6 grade. The protagonist is in sixth grade, however, and she wouldn’t have been able to read it. In fact, that’s the point. This book is for anyone who has ever struggled in school or felt like they didn’t fit in. One rainy day last July, I wandered into a bookshop and accidentally left with a stack of five new hardcovers. Just what I needed for my suitcase. The clerk was lovely. 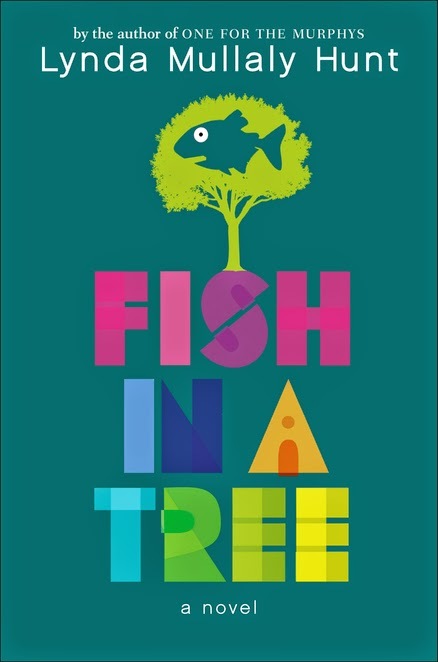 She agreed enthusiastically with all of my opinions–which is terribly charming–and I bought Fish in a Tree based on her recommendation and its adorable cover. So much for judging books by their contents…although, I finished it last night, and that’s what I’m set to do now.